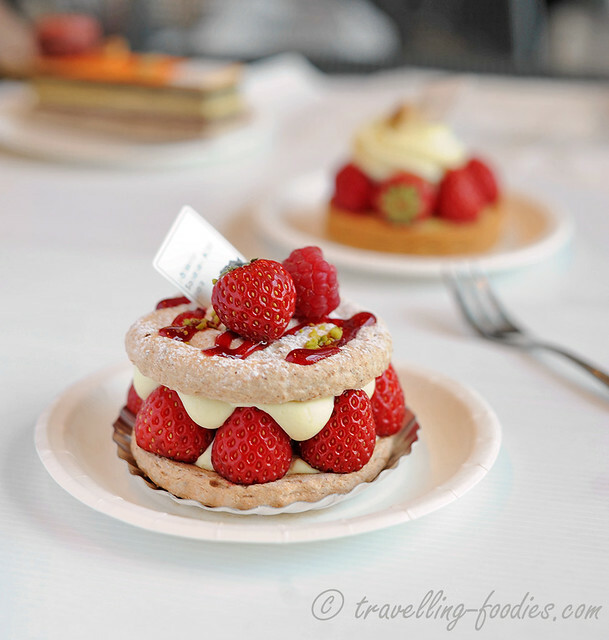 Strangely whenever we are in Tokyo, we never really thought much about visiting Patisserie Sadaharu Aoki Paris unlike the others be it local like Hidemi Sugino or Hideki Kawamura, or the “imports” like Pierre Herme and Jean Paul Hevin. I think it is because we were already sampled quite a few of his creations during our trips to Taipei where he has two dessert salons, in Bellavita and Regent Taipei. However, perhaps due to the quality of the local ingredients used or the level of sophistication his local pastry team is imbued with, friends who tried his cakes from Paris, Taipei and Tokyo told me that one could quite literally make out a difference in the “quality” of the creations between these places. Unlike the macarons and other petit gateau pour sec which are all flown in from France, the entremets and petit gateaus we see in the local stores are made in situ. Tokyo turned out to be their favorite, whose standards of pastry surpasses even those from the 6th arrondissement flagship store in Paris supposedly. That got me very curious and we knew we had to try it to believe it!